I have a pet cockatiel that is just purely adorable. Im an animal lover and I create a bond with all of my pets relatively quickly. 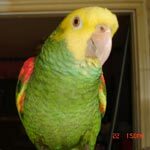 Before the cockatiel, I had a parakeet that meant very much to me. Sadly, she died in August this year. A few weeks later, at a pet shop, I saw this wonderful cockatiel that really caught my eye and I just had to get her. I brought her home, bought her food, and put her in the cage so she can go out when she feels ready for it. Its has been around 2-3 months and her behaviour hasnt improved. She is not very playful, doesnt like her toys and gets really anxious when I get close to the cage. She starts hissing? (Blowing air through her nose, hissing is kind of a harsh word for me). I talk to her every day, slowly, dont attempt to touch her but the situation just isn't improving. I cant even try giving her treats, she backs up as soon as she sees a hand. I am asking for help, can the situation improve or she just will never like interacting with me? Welcome to the forum and hissing is exactly what they do when they are scared so I don't think it's a 'harsh' word for it. Now, the word that needs to register from the last sentence is 'scared'! Because that is the reason why you are not making any advances in her behavior. You need to show her that there is absolutely nothing to fear from you, that you will never present a threat to her and that only good things come from you. Cockatiels are aviary birds [not companion like senegals, cockatoos, macaws, caiques, Meyers, redbellies, etc] and yours was obviously parent-raised [versus handfed by a human]. Her nature and the way she was raised are the reason why she is so scared when you approach her so you need to get her used to your presence without stepping on her 'boundaries'. Let me explain what I mean by giving you pointers. First of all, she needs to feel completely safe in her cage so it needs to be high up [her roosting perch needs to be at your eye level when you are standing up because nothing scares a little prey bird more than a big looming presence over it]. You also need to put it against a wall or, if this is not possible, drape a material in the back making kind of like a 'shallow' cave so the material will cover the entire back, a bit of the 'roof' and a bit on either side. This will also make her feel safer because she instinctively knows that 'walls' prevent a predator from attacking from that side. Then you have to establish a strict schedule and daily routine - NOTHING reduces stress in captive animals more than a strict routine allowing the animal to foresee and expect different actions at different times of the day. Now, to get her used to you. You already have the right idea in that you need to spend as much time as possible with her. At the beginning. the only thing you do is sit at 'her safe distance' for as long as you can while you talk/sing/whistle to her WITHOUT LOOKING STRAIGHT AT HER [staring is a predator trait so look at her from the corner of your eye until she is used to you and no longer fears you]. Her 'safe distance' is determined by her behavior when you approach her cage. Don't walk in a straight line at her, just amble around, as if your goal was not her cage but always keep on looking at her from the corner of your eye and, as soon as you see her moving in the opposite direction from where you are coming, STOP, take a single step back and MARK the spot because that is her safe distance and where you should sit to spend, at least, two hours a day. Mind you, it doesn't mean that you should sit in the middle of a room doing nothing for two hours Make it so it's next to a table or where a sofa is so you can watch TV, read a book, play video games, whatever. Always talk saying her name and praising [they might not understand the words at the beginning but they do understand a tone of voice] and, every now and then, give her a treat [a sunflower seed or an almond sliver will work] BUT, if she doesn't take it from your fingers [and she won't at the beginning], just leave it there for her to get after you move away. This is not a reward or a bribe, it's a gift, a token of friendship. You will have to clean her cage, feed and water her which she will not like so always use the same words to let her know what is coming. I say "Excuse me - excuse me - excuse me" to all my birds -even the ones that are not parrots and I am not trying to tame or win over- but you can, of course, choose your own phrase for it. The idea is for her to learn that when you say this words, you will go into her cage but that you will not try to touch her or ask her for anything. Once you are able to get close to her cage without her hissing at you or backing off, you can start target training but, in order for this to work, you will have to make sure she gets no high protein food all the time because, if you do, she will have no incentive to do anything for a high protein reward. Besides, it's very unhealthy for them to be free-fed protein food, it messes up their liver and kidneys. I recommend gloop with a different leafy green every day from breakfast and a good quality cockatiel seed mix [maybe one safflower based?] for dinner with a good quality multivitamin/mineral supplement a couple of times a week and a cuttlebone or a mineral block in her cage all the time. You can also give her fruits and veggies but, in my personal experience, the only veggies they eat are the ones in the gloop and they hardly ever eat fruits but they do LOVE their greens. One more thing, be VERY careful with her light schedule because female tiels are VERY prone to chronic laying and eggbinding which kills them if it's not treated immediately. Pajarita has covered about all of it. A cockatiel is less afraid when he has "back up". With another Cockatiel they socialize more. I had two pair. When Sweetie, a female, died the existing male stole the female from the other. I went searching for another and now I have 11. I have taken in Cockatiels that were not wanted or being treated badly. One has a chopped off wing and another has a missing leg. These birds should never have trusted a human again. When let in the Cockatiel room they disappear into the flock and don't make contact until they are ready. My little misfits need a whole flock but yours would be very happy with just one buddy. i miss having cockatiels, they are such sweet memebers of the parrot family but I am way too allegic to their powder. Take your time and your cockatiel will come around. You have already got very good advice so i am just saying listen to it and give your cockatiel as much attention as you can while still allowing them to feel safe. I agree. I don't think there is a sweeter parrot temperament than that of the cockatiel! In my experience, you don't even have to do anything to get them to like you - just give them good care and time and they will learn to trust you all on their own, bless their loving hearts! I am very sorry for not responding earlier. I have read all my comments but I have focused on other things and actually forgot to post any sort of reply. My little cockatiel is doing well. She is still quite scared with worries me though. But she isnt as scared as she used to be before. Getting really close to the cage does not really make her anxious anymore. Putting my hand inside of the cage still makes her quite scared. I found a way of touching her slowly, with her own feather. I do not even put my hand inside of the cage but rather pet her with her own feather that fell off her tail. What worries me though is my parents. They love the cockatiel but do not really know to treat her right. My dad continuously keeps chasing her inside of the cage with her hand and even thought i have told him many times not to do it, he keeps on believing that it will make her more friendly. I am really not sure what to do. I cannot let her out of the cage as she isn't really great at flying and the first time I let her out she slammed into a door. I am scared of letting her out since. Your father doesn't realize that our knowledge of what makes birds tick has evolved immensely in the last 15 or 20 years and he is using a very old-fashioned 'taming' method. We used to use flooding techniques [which is what your father is doing] but we no longer do because we learned [the hard way] that they backfire [you either make the bird dislike/hate you or break its spirit] and shorten the lifespan of our birds. He doesn't mean to harm the bird but he is harming her... It's bad enough that she is all alone [tiels are INTENSELY flock oriented and actually need the company of other tiels to be happy and healthy] but to have the constant stress of a giant alien predator chasing after her in a cage where she cannot get away from him must be hell on earth for her, the poor thing!